First of all I used real mirror tiles, tons of them! I combed the internet for the best deal on the tiles and bought about 2000. Which ended up not being enough, so I went to multiple Hobby Lobby’s and Michael’s to buy what they had left. I started about about two weeks before Halloween paper macheing my exercise ball with at least a dozen coats. Before starting the paper mache process, I wrapped my exercise ball in press and seal plastic wrap. I figured when I let the air out of the ball the paper mache would stick to the exercise ball and cave it in. Each coat of paper mache has to dry completely or it will have dents. I can’t remember exactly how many coats of paper mache I did, but it was probably around 15-20. I had to make sure the ball would be sturdy enough to dance in without caving in and it had to hold the weight of the tiles. I’m sure you are wondering how much newspaper I had to use. I basically asked everyone I knew to send me their recycled newspapers and catalogs. Where ever you decide to to do the project just know it is going to get everywhere! After the paper mache process came the nerve racking part of letting the air out of the exercise ball. Shockingly it worked!! I then cut the hole out for my head and body then tried it on. While in the ball I poked holes where I wanted my arm holes, then cut those out. I used silver duck tape around the edges of the holes so there wouldn’t be any frayed or rough edges. Next I spray painted the ball silver and let it dry overnight. Then I started glueing on the tiles. This took forever! I used a hot glue gun. I tried to use other glues only because I knew I would burn my fingers a thousand times. Which I did! After that you are pretty much done! Underneath the disco ball I wore this awesome silver sequined vintage blazer and matching pants! I made a silver tshirt to go underneath the blazer. I wore silver glittered heels and made some glittered keds incase my feet started hurting. I knew I wouldn’t be able to wear the ball the whole night so I wanted to have a cute outfit underneath that resembled the disco ball. The entire costume was a big hit! 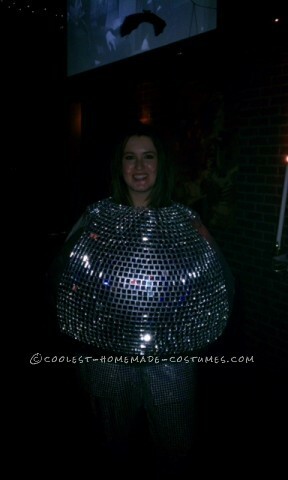 I looked like a real disco ball! Best costume I’ve ever made!